PENDLETON, Oregon – The many alleged crimes of Zachary Bartz, 26, of Umatilla County are the subject of a motion hearing today and a pretrial hearing Friday in Sixth Circuit Court. Umatilla County District Attorney Dan Primus says that, as things stand now, Bartz is charged with 30 criminal offenses in several separate incidents. “There’s a lot of material here that we need to go through and try to determine what is appropriate and what charges we actually have,” he said. Primus says he’s dealing with cases from different law enforcement agencies in the case. 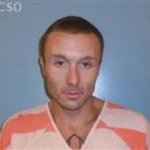 Bartz had eluded at least two attempts to arrest him by the Umatilla County Sheriff’s Office and other agencies. He was finally run to ground by Hermiston police officers in August. His bail is set at $498,500. The charges against him include two counts of unauthorized use of a motor vehicle, first-degree burglary, first-degree kidnapping, unlawful possession of methamphetamine, unlawful use of a weapon, and two counts of identity theft.